“Nice job, six minutes left,” bandana-clad chef David Bouhadana says to me, flipping a digital timer around to reveal the clock still counting down. Bouhadana, a free-spirited, 31-year-old, Jewish sushi chef from South Florida, is famous for his fight with New York’s Department of Health -- he’s the guy who started a petition to abolish a law mandating that chefs touching ready-to-eat food must wear plastic gloves. For his newest project, Sushi by Bou, the concept is simple: Eat a 12-piece, $50 omakase (affordable by omakase standards) in under 30 minutes, or don’t bother reserving a seat at the four-person counter. While he’s never seen a chef use a timer with customers before, Bouhadana notes that timers are an integral part of chefs' daily routines. He also credits his sense of efficiency to the Japanese. Chef Jiro Ono, of the famed 10-seat Sukiyabashi Jiro in Tokyo, is known for serving up a $300 omakase in 30 minutes. Recent Japanese-to-New York imports like Ikinari Steak, where you stand as you feast on a ribeye, or Ichiran Ramen, renowned for its solo-slurping booths, also capitalize on this efficiency. Still, anyone who has dealt with the MTA or a Seamless delivery time knows that New York is still far from an efficient city -- hence, Bouhadana’s timer, which lets out a high-pitched, please-press-snooze beep when time is officially up. Back in November 2015, Bouhadana was let go from Sushi Dojo in the East Village, after the DOH temporarily shut it down thanks to his refusal to wear gloves while preparing sushi. Following his departure from Dojo, Bouhadana began working on an open-air omakase concept, called Sushi on Jones, which opened at the Bowery Market last July. Jones, where Bouhadana first introduced the timed dining concept, was intended to be an interim project -- he hadn’t planned on making his big comeback. But the 12-piece omakase in 30 minutes for $50 format hit the right note with New Yorkers almost immediately. Bouhadana recalls being wowed by the lines that formed at Jones, and the resulting Instagrams with hashtags like #LessTalkMoreEat. Unintentionally, the DOH’s most public enemy in the industry had created a completely new category of upscale, quick-service omakase catered specifically to New Yorkers. After splitting with his business partner (for unspecified reasons) in March of this year, Bouhadana was effectively divorced from Sushi on Jones, as well as a planned upscale sushi project on the Lower East Side. Two months later, he opened Sushi by Bou inside the Gansevoort Market, taking a corner spot in the 14th Street food hall, just between the bathrooms and a chicken-in-a-cone concept. Sushi by Bou may be the most alluring stall in the Gansevoort Market, with a neon, street art-esque fish painted over geometric colored lines on the wall, all illuminated by a pink fluorescent sign touting the restaurant’s name. A corner counter balancing a case full of raw fish features four seats on one end and four on another, part of a pop-up within the food stall called Sushi by Bae, where Bouhadana’s protégé, 24-year-old Oona Tempest, serves a 90-minute, rotating omakase at dinnertime for double the price. “I wouldn’t [call it] affordable sushi, I would say sushi for the people,” Bouhadana says of Sushi by Bou. “Because affordable sushi is different -- that’s Dean & DeLuca, that’s Sugarfish. This is a very New York concept. Fifty bucks isn’t a great deal for most people, but in New York City, it’s a steal.” For comparison, omakase at the West Village’s Neta ranges from $110 to $230, while Shuko in Union Square starts at $135, and Flatiron’s O Ya can be anywhere from $185-$245. 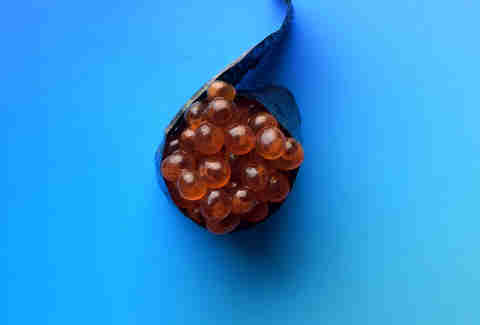 The rise of so-called affordable omakase, like LA-transplant Sugarfish (which starts its omakase at $27), doesn’t make Bou the cheapest in the city, but, as New York Times critic Pete Wells wrote in his review, Sugarfish’s omakase is largely lackluster. He claims he tries to “feel the energy” to pace the meal (if you do the math, 30 minutes for 12 pieces gets you two and a half minutes per piece), and while you won’t be forcibly lifted from your seat if you do go into overtime munching on your uni, the chef employs an arsenal of gentle nudging tactics to accelerate dawdling diners. Diehard Bouhadana fans will notice that he’s once again plating sushi sans gloves. 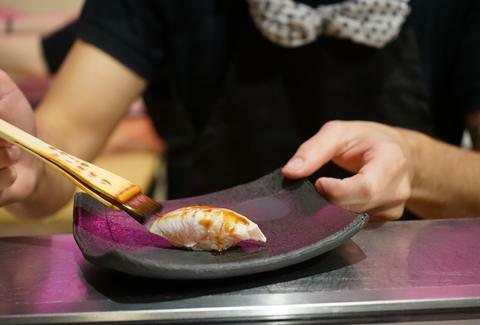 Sushi-making originated long before health code was written, but New York’s restriction that ready-to-eat food can’t come in contact with bare hands applies to all cuisines, from omakase spots to taco trucks. States like California and Florida, where Bouhadana grew up and kicked off his career at the age of 18, don't have that same law; he also claims all upscale sushi chefs in New York go bare-handed, but shout out a secret code to get their gloves on whenever the DOH walks in. Melissa is a writer and sushi lover living in NYC. Follow her on Twitter and Instagram.